Looking for an out of this world holiday gift opportunity or an incredible marriage proposal or anniversary idea? Through Monday, eBay and Uwingu have partnered to give anyone the opportunity to naming rights for the biggest unnamed crater on Uwingu’s Mars map — a first of its kind auction. With over 14,000 craters named on it by the public in 2014 alone — more than 10 times the number named by scientists in the past 50 years, Uwingu's Marsmap is becoming a de facto standard as the most complete map of martian craters. The huge ancient crater, located at 25.1° south latitude and 327.3° east longitude on Mars, is 391 miles (627 kilometers) in diameter — as big as the state of Florida; it is bigger than 60 percent of the countries on Earth. As with all Uwingu efforts, 50 percent of the proceeds will go to Uwingu Fund sales to support space exploration, research, and education grants. For the eBay auction, the National Space Society will be supported via eBay’s Giving Works program. The balance of the Uwingu Fund proceeds from the auction will benefit other grant recipients of the Uwingu Fund, including the Mars One project and other efforts to further space education, exploration, and research. See examples of past Uwingu grants at http://www.uwingu.com/the-uwingu-fund/currently-funded-projects/. 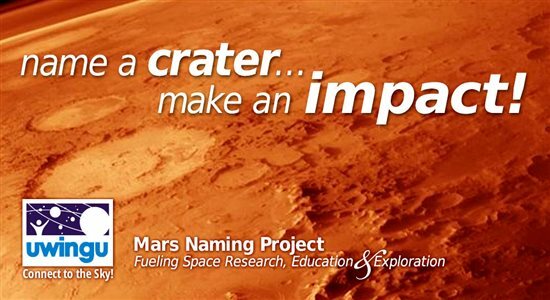 The name given to the crater by the eBay auction winner will forever be recorded on our new map of Mars and then sent to Mars by the Mars One project. The winner will also receive a framed certificate of naming, two VIP passes to the Mars Insight mission launch — NASA’s next Mars launch — and a handsome desk globe of Mars valued at over $300. In addition to bidding on the eBay auctioned crater, enthusiasts, gift givers, and supporters are encouraged to go online at www.uwingu.com and support Uwingu’s goals by naming smaller and mid-sized craters as holiday gifts to loved ones, friends, and co-workers. Prices range from $5 to $5,000 depending on crater size.